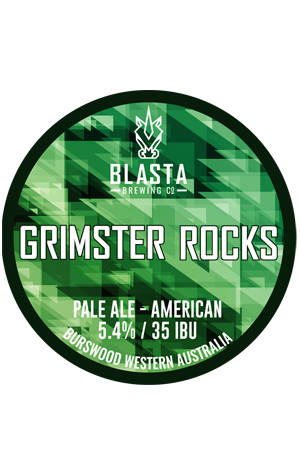 One of the Blasta’s best selling beers, Grimster Rocks delivers everything that you’d expect from a Mosaic focused pale – masses of stone fruit and tropical aromas – particularly passionfruit - that are supported by potent grapefruit and candied orange flavours, balanced by some sweet caramel malts, before wrapping up with a reasonably biting bitterness. The 5.4 percent ABV and 35 IBUs of bitterness make Grimster Rocks more of a serious contender without losing sessionablity, albeit one in which there's been no holding back on the hops. Grimster Rocks takes its name from a race horse named after Blasta founder Steven Russell’s brother, who passed away unexpectedly in 2010. Now Grim lives on as Blasta’s Champion Pale Ale, the title it took out at the 2018 Perth Royal Beer Awards.